Kicking off with some old school hip hop soundwaves cooked in the heart of Denmark. 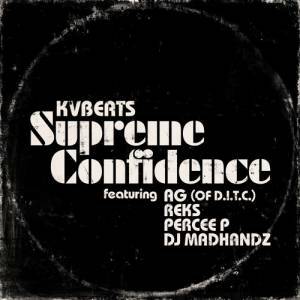 Meet Danish beat-maker KVBeats and his track "Supreme Confidence" featuring nderground heavy hitters AG (of D.I.T.C. ), Reks, and Percee P. The track is a roller coaster from the very first beat and if 90s hip hop is dear to your heart, then you'll found your next favourite tune. It also kicks off with a sample off Mike Tyson famous lesson in intimidation. Pure fire! "Supreme Confidence" will be part of KVBeats' forthcoming producer LP, The Breadwinner which is set to drop on Dec 21 via Ill Adrenaline Records.